There's a famous song within the Timbers Army that uses the following line of "Vancouver, S**ttle, Montreal" as one of the refrains, but if you talk to many fans, they weren't aware of the Timbers' long history in playing the Montreal Impact in soccer. The two franchises played 15 times in league play when they were both in the old A-League/USL First Division between 2001 and 2010 before Portland joined MLS in 2011. Montreal joined MLS a year later to allow the old rivals to battle once again, but due to the unbalanced scheduling, the teams have only played one per season. As a matter of fact, the MLS Impact was making their third visit to the renovated Providence Park. Going through a crazy offseason that saw management relieve their former coach of his job and bring on new coach Remi Garde, the Impact are trying to adopt a similar playing style to the tactics that the Timbers have adopted under Coach Gio Savarese - pressing the ball on defense, ball and player movement, stout defense, attack on the counter, allow possession by the opponent but clog the passing lanes. For the first forty five minutes of the match on July 21, there was one team demonstrating these tactics in picture perfect form - the visitors. The Timbers woke up after the halftime break and spent the second half scrambling to find the offense, and while they were able to score a goal to earn a 2 all draw to extend their unbeaten streak, this was easily one of the most disjointed efforts we've seen from the Timbers in some time. Garde has at his disposal one of the most intriguing individual players in MLS, forward Ignacio Piatti, who at 33 years of age is still quite an accomplished scorer and distribution of the ball. Piatti leads the team with 10 goals scored and 8 assists, but Garde and the Impact have overhauled their midfield by adding Alejandro Silva, Jeisson Vargas, Saphir Taider and most recently, Shamit Shome. Defensively, the club added some pace with Rudy Camacho and Jukka Raitala and bulk with Rod Fanni to supplement holdover defender Daniel Lovitz, and added goalkeeper Clemente Diop to push incumbent Evan Bush. The mix had given them unpredictable results: when the Impact have been good, they've been very good in hovering in the middle of the Eastern Conference, but when they've been awful, they've been dreadful. Garde chose to start Piatti up top in a 4 - 3 - 3 attack alongside Matteo Mancosu and Silva with Samuel Piette, Taider and Shome manning the midfield. With Bush in goal behind a defensive line of Fanni, Camacho, Lovitz and Raitala, the intent for the Impact was to play counter possession and break down the Timbers using diagonal passes in the middle or stretch the defense along the touchlines with deep runs or passes. The real keys for success would fall upon the defense to help Bush, who much like his team can be very good in goal or sufficiently awful. Diego Valeri added to his team lead in goals scored with his 7th tally of 2018. Savarese was dealing with some serious lineup issues of his own, as he didn't have the services of Diego Chara due to an accumulation suspension after Chara was cautioned in the scoreless draw versus LAFC back on July 15. While Diego did play in the midweek U.S. Open Cup match also against LAFC on their grounds, Savarese would enlist Lawrence Olum to be the middle link in the midfield between Cristhian Paredes and Andres Flores. While Fanendo Adi continues to train with the team, he's been conspicuously absent from the game day rosters, and Savarese again used Samuel Armenteros as the lone striker with Andy Polo or Jeremy Ebobisse as the available striker subs. 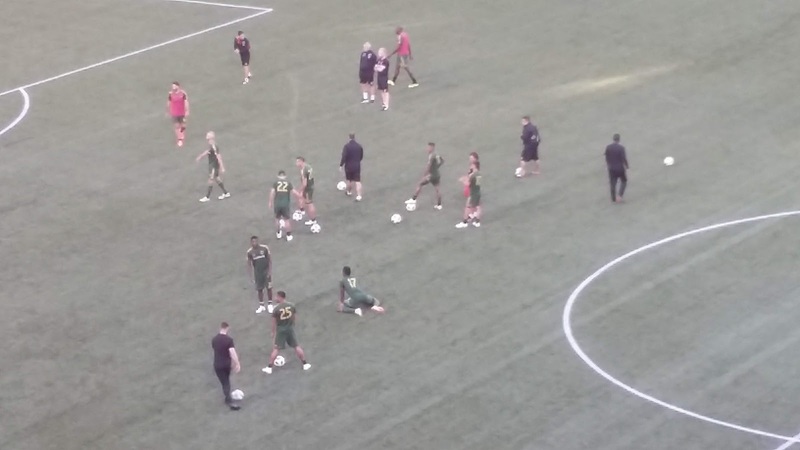 Outside of these situations, the rest of the lineup to start was consistently familiar: Jeff Attinella in goal, Zarek Valentin, Larrys Mabiala, Julio Cascante and Alvas Powell on defense, and Sebastian Blanco and Diego Valeri as the attacking midfield. This group has been very solid for many weeks, but the past two matches - the win over San Jose that was closer than anyone expected and the draw in LAFC - have been a bit more roller coaster. 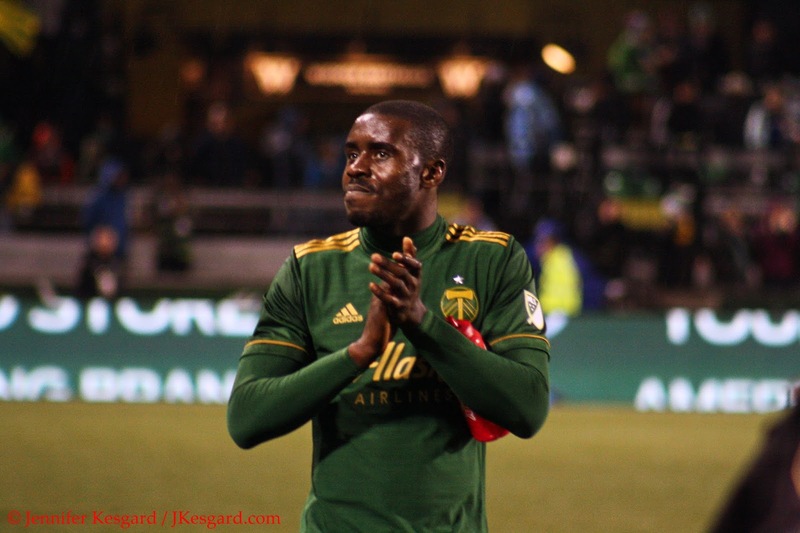 Winning is never easy and sometimes the margin is razor thin, but the Timbers have shown good resourcefulness at points as well to put forth their extended unbeaten streak. The match versus the Impact started the Timbers' longest homestand streak in their MLS history with 4 consecutive home matches to end July and start August, but it was the visitors that started out with the better runs as Shome and Taider had good early chances for Montreal as the Impact pressed the Timbers from the onset. With Olum getting the start, the Timbers were trying to find their rhythm, but it wasn't until the 22nd minute that the Timbers threatened the goal as Blanco spun a shot past the far right post off a drop pass. For Portland, they played more passively with space and as such, Montreal was able to exploit open channels as the Timbers also seemed unsure of where to direct their offense to threaten the Impact goal. The situation got worse when Silva tapped a pass to Taider just outside the Timbers box in the 23rd minute, and the Impact midfielder was able to slot it past Attinella to put the visitors on top 1 to 0. Silva had collided with Valentin on the right flank and fell to the turf, but it was Silva that was able to recover faster and push the ball to an awaiting Taider as the Timbers' defense was slow to react. Yes, we missed this guy against the Impact. A lot. Silva and Piatti had several near misses between the 28th minute that could have added to the lead, while Portland came very close to scoring in the 26th minute when an Armenteros cross found Valeri in the box, but the Maestro's header was over the bar. Portland restored some order in the 38th minute when Powell put a speculative cross over to Paredes, who put a missile right at Bush. The Impact keeper made the initial save, but he spilled the ball into the path of Armemteros, who put a one time shot past him to level the score at 1. The celebration seemed to uplift the home crowd and provide a sense of relief, but it was very short lived as Piatti and Mancosu put Montreal back on top seconds later. Piatti put a pass to the left corner for Mancosu that looked offside, but Mancosu was even with the last defender as the Timbers defense again was slow to react and recover. Mancosu slotted the ball past Attinella with his left foot and suddenly it was 2 to 1 Impact. The goal seemed to wake up the Timbers as Valentin and Cascante both had good shots near first half stoppage time, but for the Timbers, they now faced a deficit going into halftime. Portland had already overcome the one goal deficit, but could they do it a second time, considering that the team seemed very disjointed and passive. You could easily understand the compression of fixtures in a unique situation where the Timbers played LAFC back to back to for different purposes, which meant extending their stay in Southern California through July 18, and getting back to Portland sometime the following day. Not being able to practice in your own facilities does weigh on a club, but the LAFC U.S. Open Cup match ended up adding a lot of emotional intrigue. While the Timbers did eventually withdraw their protest of the match, the team had file a grievance upon learning that LAFC might have used too many international players; the USSF was slated to review the situation on July 21 until Portland withdrew upon learning that there was some discrepancy in Mark-Anthony Kaye's status. While the team accepted the results, the fact of disputing it for a rules violation had to add some emotions to a tensely played match where there were several skirmishes. This was compounded upon when LAFC forward Adama Diomande reported after the match that he was referred to using a racial slur. 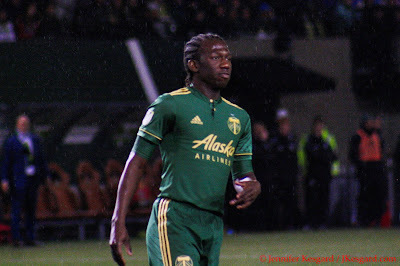 While the team continues to investigate this situation, there could be some impact over the final moments of the match when Diomande and several Timbers had to be separated for various altercations during the match. That doesn't completely excuse the flat play, however, but it was nice to see the Timbers come out for the second half 2 minutes early as a team and rally about Valeri and Blanco to get last second messages and other encouragement. It was a much different Timbers side that put Montreal under more duress by pressing players and passing lanes, and the Impact could only muster 3 officials shots for the second half, all 3 by Silva. Otherwise, it was Portland on the front foot with a cascade of possession and chances on goal with 12 total shots and 8 on target. Valeri had a point blank effort in the 53rd minute off a give and go with Blanco that left the Montreal defense flat footed, but Bush was able to catch that effort plus deflect a Cascante header minutes later. 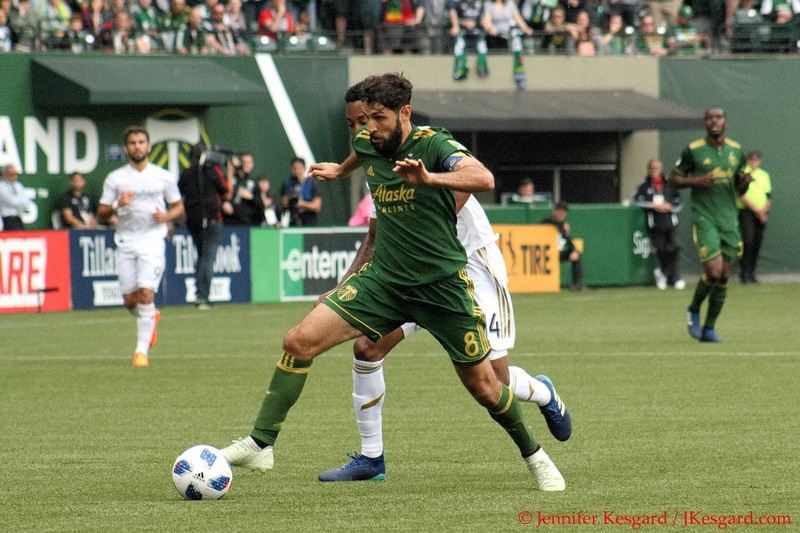 Bush wasn't able to keep everything out of goal, and in the 64th minute, he spilled another ball that the Timbers were able to use to level the score. Off a cross from Blanco from the left flank, Bush made the initial deflection but he blocked the ball straight up in the air, and Valeri moved in for the rebound. While Bush and Valeri briefly bumped into each other, Valeri was able to outmuscle the keeper and tap the ball into goal for his seventh goal of 2018. Montreal protested the goal based on Bush being fouled by Valeri prior to the goal, but VAR review determined there was no reason to overturn the goal and it stood. Garde protested this decision, and center official Fotis Bazakos ejected the Montreal coach for his conduct. Portland generated several other chances to see if they could take the full points, with the best being a 77th minute shot from Powell that forced a diving save from Bush, but the Timbers couldn't add to their total and the match ended up deadlocked. Savarese even brought on Andy Polo and Dairon Asprilla for Paredes and Blanco to see if more space could be created, but the speedy players weren't able to influence the outcome. It should be noted that Bazakos and his crew had a rather uneven match in terms of officiating. 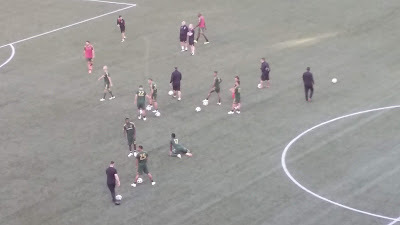 Bazakos allowed several early fouls that affected the rhythm of the Timbers' offense or he called advantage, yet the players hesitated slightly expecting a call. Montreal was upset with the officiating as several players yelled at Bazakos about grabbing and shirt pulling, but the crew issued just one caution on the night plus Garde's ejection. It did appear that Bazakos allowed contact in several instances but otherwise called the match tight at points; he did get the right call in the 69th minute when Fanni executed a sliding tackle on Armenteros in the box to take the ball away, and the replay determined Fanni got the ball first and Armenteros stumbled over the top of him. While the sides could point to frustrating officiating at times, Savarese pointed the disconnect strictly at his players, saying they were too passive and out of sorts in the first half, but he was proud of how they rallied to overcome a deficit twice to earn a point for the draw. Portland now turns its attention to another Western Conference foe when the Houston Dynamo visit Providence Park. The Timbers and Dynamo met in the 2018 preseason, but the Dynamo are starting to find their form with an improved offense around Romell Quioto and Alberth Elis. The match, originally scheduled for 6 pm on July 28, has been moved to an 8 pm kick due to severe heat in the Portland area, but I still expect some fireworks between two very good offensive sides.